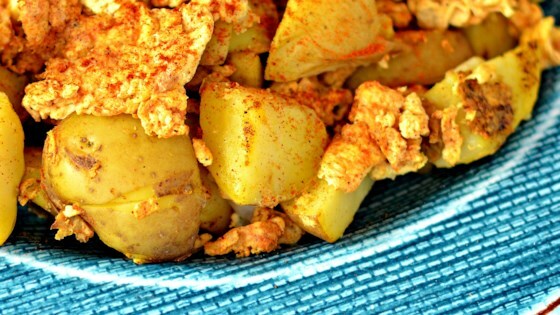 "Spicy fried potatoes and a classic egg scramble combine to make a hearty and zesty breakfast." Poke potatoes with a fork so that their skins are pierced. Microwave potatoes on high until cooked inside. When potatoes are fully cooked, peel potatoes and cut potatoes to 1/8 size or to your liking. Set potatoes aside. Add 2 tablespoons oil to skillet and scramble 3 eggs. Add salt and pepper to taste. Keep warm until potatoes are ready. In another skillet, heat 2 tablespoons oil until hot. Then add salt, cumin, coriander and turmeric powder. Put in chili powder if you want it really spicy. Add potatoes and cook until potatoes are crispy and brown. Spicy potatoes and scrambled eggs are now ready to serve! Very simple but lacking something. Peppers, onions, garlic, cheese, ...something. Great idea to nuke the potatoes before frying. VERY GOOD..TO CUT BACK ON TIME I USED CANNED POTATOES. Really good and flavorful...this is a nice change from regular scrambled eggs. I pan-fried the potatoes, added tomatoes, and doubled the spices for delicious scrambled eggs!